Of all the great instructors at the festival known as Jazz on the Mountain at Whistler (or JOMAW, to those in the know), one of the nicest tones and most delicate touches came courtesy of Lorne Lofsky. The Oscar Peterson sideman held a riveting master class where he covered a variety of topics, including an introduction to quartal harmony, or diatonic harmony based on fourths. Anyone familiar with the piano work of jazz greats like Bill Evans or the guitar playing of Pat Martino or Joe Diorio will recognize the sound of quartal harmony. For the uninitiated, quartal harmony has an open, modern sound that is somewhat ambiguous in terms of major or minor tonality. Lofsky effortlessly created huge, pianistic voicings and vamps with these shapes. 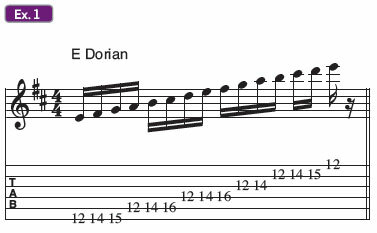 “I’m going to play diatonic fourths in D major,” he explained, “but I’m going to play them over E, so it’s E Dorian.” The notes of the E Dorian mode are shown in Ex. 1, and Lofsky’s series of fourth shapes is shown in Ex. 2. These forms are easy to grab and simple to move around. Pay attention to the G-C#-F# grouping on the and of one and the D-G-C# on the and of two. The augmented fourths in those chords add additional color and tension. Also, resist the temptation to move these voicings off the A, D, and G strings until absolutely necessary, as Lofsky explains, referencing one of the all-time greats, Lenny Breau. “What Lenny would do,” says Lofsky, “is voice those fourth shapes on the higher frets on the A, D, and G strings. That makes it possible to add a diatonic fifth to each chord.” He then barred across the seventh fret to play the E-A-D-B voicing shown on the downbeat of Ex. 3 before hammering a high D above it. Cruise up through the other shapes in a similar fashion. 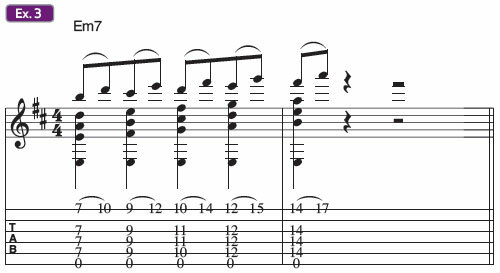 (Because we’re avoiding the B string, you can’t just strum through these voicings. You’ll need to carefully grab them with all your picking-hand fingers or employ a thumbpick and fingers like Lofsky.) Against the low-E pedal tone, these chords make for a super-hip approach. “They sound much bigger than standard guitar shapes,” he says. Ex. 4 takes the same idea but plays it in a descending fashion. This is where the jazz truly meets the rock, because these sounds add up to a Michael Schenker via Alex Skolnick take on Schenker’s classic “Rock Bottom” solo. The first beat of bar 2 is a little tricky to fret but worth the effort. Ex. 5 actually simplifies things a bit in order to make these shapes more mobile. Although the voicings created can be called a variety of names, such as Em11, Bsus2/E, etc, don’t worry about that right now. 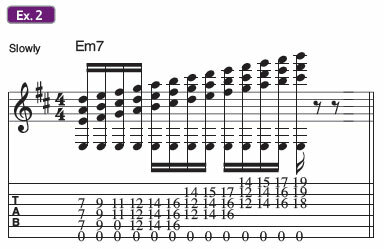 Just look at the collection of chords as an intriguing way to create drama over an E pedal tone. Fair warning: Once you start down this road, these rich sounds can be highly addictive.